Ground plan of the Hoysalesvara Temple, Halebid. ‘Plan of the Great Temple at Ouncel Iswar at Dora Somadram. bl.uk > Online Gallery Home	> Online exhibitions	> Asia, Pacific and Africa Collections	> Ground plan of the Hoysalesvara Temple, Halebid. 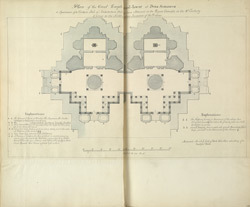 ‘Plan of the Great Temple at Ouncel Iswar at Dora Somadram. Pen-and-ink plan of the Halebid temple in Karnataka with accompanying notes by an unknown artist between 1803 and 1808. This image is from a collection of 156 drawings (185 folios) chiefly of architecture and sculpture in South India made between 1803 and 1808. Halebid, legendary for its wealth and splendour, was the capital city of the Hoysalan Dynasty who ruled an area in the south of India between the rivers Krishna and the Kaveri. The temple (1121) took 80 years to complete and represents the height of Hoysalan Karnatic art and architecture. It is decorated with a profusion of gods, people, animals and plants with illustrations of parables, tales of war, hunting, music, dance and agriculture. The city declined after Muslim raids of the 14th century.